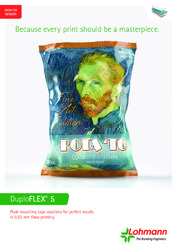 Our DuploFLEX® 5 EB range of adhesive tapes has been specially developed for 0.020" flexo printing and offers you all the benefits demanded from flexible packaging printing. Thanks to a wide range of adhesive tapes with varying foam hardnesses and adhesive properties, you can always call on the perfect product to meet any flexo printing task. You benefit from perfect printing results that give you a decisive advantage over the competition. Fine process work, brilliant half-tones, perfect solids; no matter the printed image, the DuploFLEX® EB 5 range promises excellent results. Use the table below to see what adhesive tapes we recommend for each application. With six different foam hardnesses and two different sets of adhesive properties, the DuploFLEX® EB 5 range truly gives you the freedom to always make the best choice for each printing job. Storage considerations are also accounted for with individual color-coding on each set of packaging, allowing easy product identification. 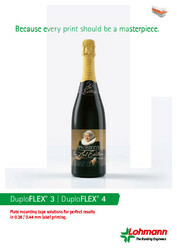 In addition, all DuploFLEX® packaging is fully recyclable. You can save not only the environment, but your own disposal costs too. Call us today and let our experts answer any questions you may have. In contrast to conventional foam adhesive tapes with a laminated PET film, our DuploFLEX® 5 EB range features a double-sided flexible PE film layer. 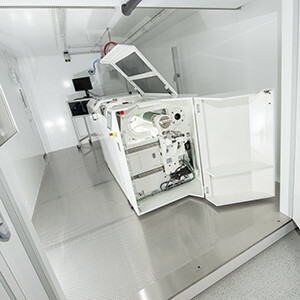 This is a key design feature that ensures optimum printing results. It sees that the forces applied to the compressible foam are perfectly cushioned, resulting in no uncontrolled dot gain and an excellent printed image, even at high printing speeds. Regardless of the printed image you're striving for, DuploFLEX® 3 and DuploFLEX® 4 guarantee excellent printing results in both the 0.015" and 0.017" ranges. 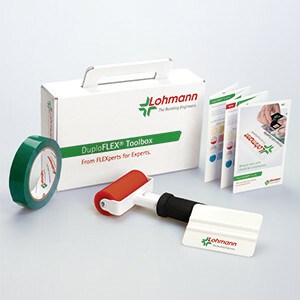 The double-sided flexible film on Lohmann printing plate tape solutions ensures optimum printing results. The forces acting on the compressible foam are perfectly cushioned. 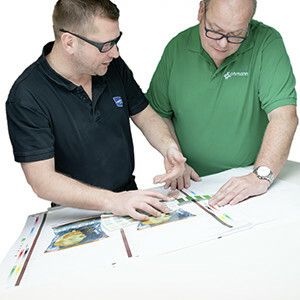 Uncontrolled dot gain is prevented and an extremely sharp printed image is achieved - even at low printing pressures. PET film carrier or single-sided adhesive high quality polymer foam – whatever your needs, the DuploFLEX® CB range provides you with the tools to create perfect results in flexographic cardboard box printing. Individual colour-coding on each set of packaging allows easy product identification. 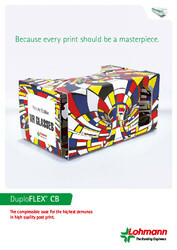 In addition, all DuploFLEX® packaging is fully recyclable. You can save not only the environment, but your own disposal costs too. Call us today and let our experts answer any questions you may have.